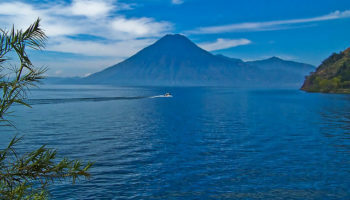 Peppered with volcanoes and ancient Mayan sites, Guatemala is a country rich in history, natural beauty, colonial towns and a year-round comfortable climate, making it a well-rounded tourist destination. Sandwiched in between Mexico, Belize, Honduras and El Salvador, Guatemala features a long Pacific coastline and a parcel of Caribbean shore. 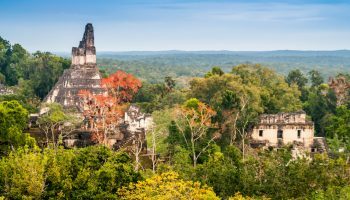 Only a small percentage of Guatemala is urbanized, leaving the rest of the country to lush rainforests, majestic mountains, steep volcanoes and verdant valleys dotted with Mayan sites, of which Tikal is the largest and most impressive. 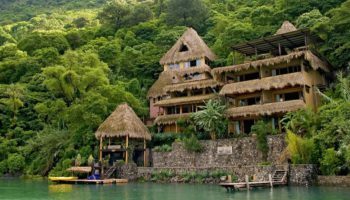 Picturesque regions surrounding Rio Dulce and Lake Atitlan are popular for their scenic beauty, charming villages like Panajachel, and abundance of wildlife and outdoor recreation. The capital, Guatemala City, sprawls across a huge upland basin, surrounded by craggy hills. 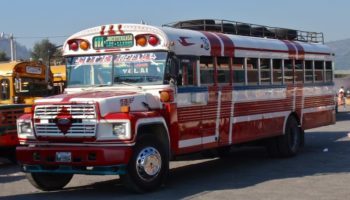 The largest urban agglomeration in Central America, the city is a fume filled maelstrom of industry and commerce with few attractions to detain the traveler. 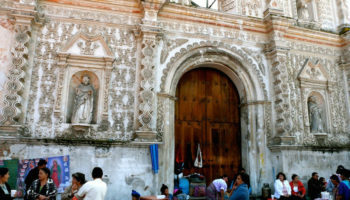 Nor far from Guatemala City however is the country’s former capital, Antigua, a picture-perfect colonial town. Quetzaltenango is a bustling city in the western highlands, while Puerto Barrios is a beautiful Caribbean seaport, and Monterrico is a popular Pacific beach known for its black volcanic sand. 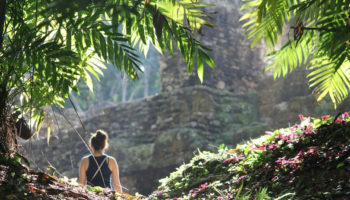 The gateway to the Tikal Mayan ruins, the island town of Flores, on Lake Peten, offers plenty to see and do within itself.